Say the name of this episode with a Texas accent. It’s important for the proper effect. With Mother’s Day coming this week, I’m honoring my own mom and sharing some of the things she did that I seek to imitate (that’s the word I couldn’t think of!) in my own parenting. Being the mom of a slob is tough. She knows this trial well. But (spoiler alert) she was purposeful about keeping our relationship strong despite her frustrations over my “issues” with cleaning and clutter. This week’s sponsor: PrepDish! – Get a free two week trial of this meal planning service! Read Newer Post This Evil or that Evil? 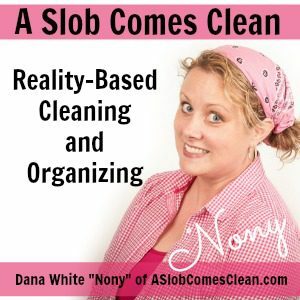 Read Older Post Spring Cleaning/Decluttering – Dust Covered Clutter? Or Clutter Covered Dust? A happy mother’s day Dana! Every mother does an amazing job no matter what kids they have! 🙂 Just wanted to say I am loving your new book and am appreciating being able to share it with my audience. Thanks so much! thank you so much for what you do. I am a 27 year old slob with 2 tiny humans and one man child . with your help I am starting the journey to develop the habits I need in life.